Beautifully encased within a cuboid of coloured glass, the details of the artisans craft work is displayed in this functional but stylish knob. 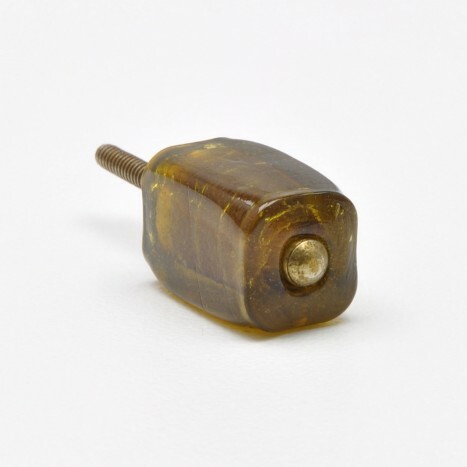 With all the uniqueness and organic imperfections of hand crafted glass, this amber like knob envelopes the hardware it sits upon. Enhance your vintage décor with this glass knob, creating a warm sensation of luxury and exclusiveness. The item will perfectly complement rustic-inspired furniture, antique wardrobes and traditional chests of drawers. It will serve as a beautiful accessory to a filing cabinet or interior doors. Tags: brown square glass pull, brown glass cupboard knobs, vintage amber knobs, glass amber pulls, retro glass cupboard knobs, handmade glass pulls, antique glass cupboard pulls.